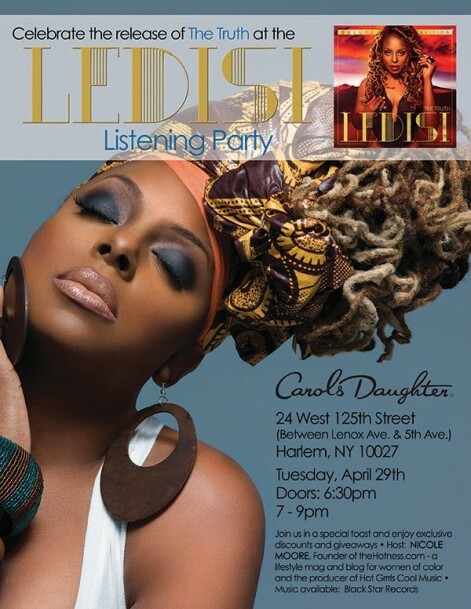 Please join me TONIGHT @7pm as I host a Ledisi listening party at Carol’s Daughter in Harlem! No RSVP required! I was in the audience that November in 2010 at The Paradise Theater in the Bronx for BET’s epic production of the Black Girls Rock Awards Show. I watched Ledisi pull, pump and puncture the heck outta Nina Simone’s “Four Women.” Although the performance also featured Kelly Price, Marsha Ambrosius and Jill Scott, it was Ledisi who brought that brown baby home with her resounding exclamation, “My name is Peaches!” It was Ledisi who everyone was asking about and raving about at the end of the night. That night Ledisi had her Ricky Martin Grammy performance moment. She had arrived and now on her seventh album, “The Truth,” she is letting it all hang out– giving us a lil Peaches and a whole lotta Led! And if you’ve heard her smash single “I Blame You,” you know that she’s in a great groove.